I’m back in one piece. Moving to a hotel owned by the Mouse. Alert the authorities if I do not emerge from the Magic Kingdom by Sunday. Is it really sleeping in if you simply maintained your regular sleep schedule but that the hours themselves are in a different because you’re in a different time zone? I’m not sure exactly what time I went to bed last night, but I think it was probably 3am PST (that’s what I remember my laptop saying anyway). I got up at 11am today. That would be 11am EST. Hooray for 5 whole hours! I had to update my voter registration, which I did in the appropriate time frame. I sent in for an absentee ballot for myself, my mom and my brother (at the same time). Received sample ballots for all. But we realized today that my Bro is the only one with an absentee ballot. Therefore, he’s going to be the only one of us who can vote (since Mom and I are both going to be out of town on Election Day). Ironically, he is the only one of us who didn’t actually NEED the absentee ballot. It does not feel like vacation yet. Why the heck did I have to stay up all night and STILL not be done with everything I’m supposed to work on tonight? And that’s right, I said vacation. Details possibly forthcoming. Possibly not. Went to a screening a few weeks ago of Paramount’s “Flushed Away.” Enjoyed it. Loved the slugs. Watched a crapload of TV. Cleared the TiVo in anticipation of being out of town for a week. Went to a special screening earlier this week for Paramount’s “The Freedom Writers” coming out Martin Luther King, Jr Weekend 2007. Had just devoured the book last weekend while out of town to San Jose. Loved the book. Enjoyed the movie as well, though as you might suspect, the book is stronger. The screening was a special ‘friends and family’ screening in Newport Beach by Erin Gruwell (the teacher who inspired the movie) and we got to meet actual Freedom Writers. Very inspiring. Picture(s) possibly forthcoming. Ok, that’s it. Need sleep now. Getting up in two hours. The morning started with another wake-up call from Mom. (She had called last weekend, but I didn’t hear the phone ring when she called.) We talked for about 20 minutes. I was going to try to get out of the office a little early today but I ended up working my full 8 hours. Now to come up with some research for a report I’m doing for my Finance class… due to my classmates at a meeting at 9am tomorrow. Is it bad that I wake up earlier on weekends than I do most weekdays? …but guess what finally arrived for me yesterday? 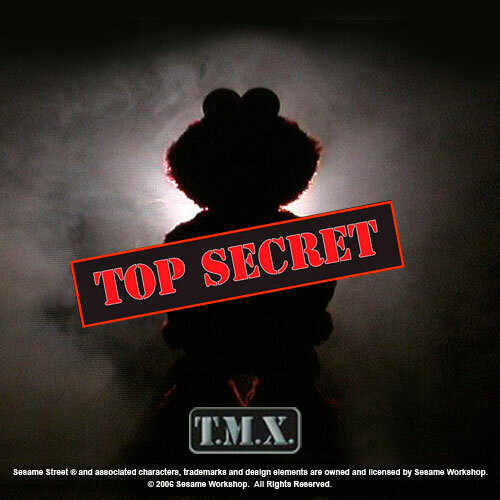 That’s right… my TMX Elmo! I got it at the pre-order price of $39.99, too! Time is just racing by and I can’t help but to feel bittersweet about it being November already. The days are shorter. The nights are longer. We’re heading into the holiday season and the end of the year. And, oh yeah. I’m having a birthday later this month. I was supposed to be excited about it, but instead I’m so sad about my Dad not being around for this one. We were supposed to spend it together as a family. Aside from my birthday, there were other things we would have been celebrating together this month. Is it wasting a wish by wishing for something that can never happen? The jozjozjoz.com archives for November, 2006.